Yesterday I discovered that my favorite arcade game, “Kung Fu Chess,” is no longer on the internet. It’s gone. The site is down with no replacement, no link to a new site, no mention of whether it’ll ever come back. Some of my computer geek friends in Charleston introduced me to this game seven or eight years ago. Kung Fu Chess is (I say “is” in the hopes that the game is still available somewhere out there, perhaps at a different website, perhaps waiting to be relaunched on the old website) chess without turns. You can move as many pieces as you want without waiting for your opponent to move his. The only restriction is that once you’ve moved a piece, you have to wait ten seconds before moving it again. You can dodge attacking pieces, you can capture other pieces with a piece already in motion. Throw in some kung fu sounds whenever you kill an opponent’s piece, some cheesy techno in the background, and animals wearing martial arts outfits as your avatars, and you’ve got the greatest, geekiest, time-killingest online arcade game of all time. Here’s a YouTube sample of a high-rated game, minus the sound effects and plus some other background music. I hadn’t played in a few years, due to work–which insists on infringing on my goof-off time (the feds should do something about that). I visited the website about a year ago, but found that the game doesn’t work on Macs. And now it’s gone. I wept a little. 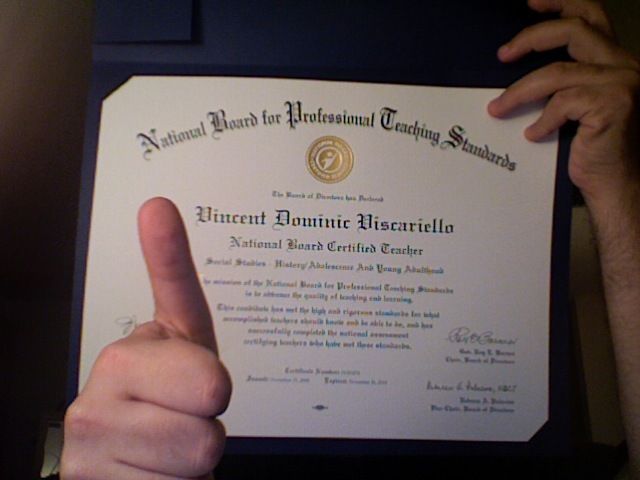 In happier news, today I received my National Board certificate. Congratulations on the board certification. I had heard that you knocked the writing portion out of the park on your first try. You deserve it. Posted in 2009, Uncategorized on February 23, 2009 by VDV. ← In which I play the role of demagogue.